Is Trump About to Bring a Maverick Democratic Congresswoman Into His Cabinet? 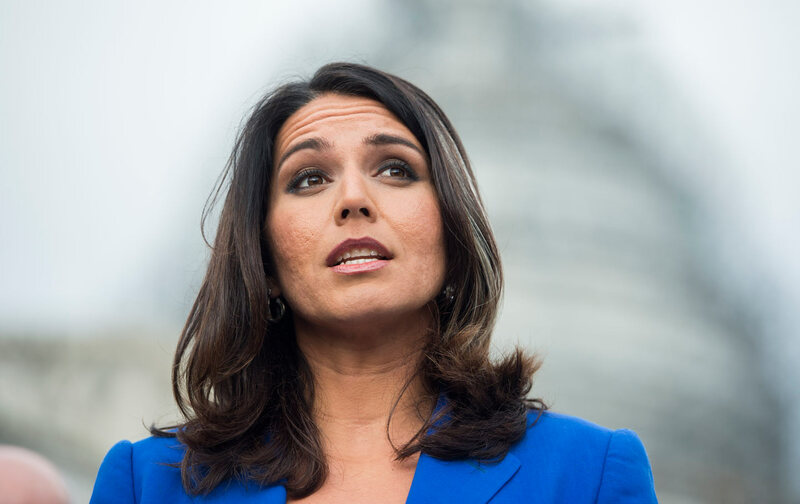 Tulsi Gabbard and Donald Trump both reject the foreign-policy establishment’s fidelity to the twin policies of military intervention and regime change. That Gabbard, an Iraq War veteran and a major in the Hawaii Army National Guard, is now said to be under consideration for a number of high-level posts, including secretary of state, secretary of defense, and ambassador to the UN, is a small, yet positive sign that Trump may not (yet) be held captive to the regnant foreign-policy orthodoxy to which almost the entirety of the Washington establishment remains in thrall. The meeting between Gabbard and Trump makes sense given that the two share some common ground on a number of foreign-policy issues, particularly as it concerns the foreign-policy establishment’s unquestioning fidelity to the twin policies of military intervention and regime change. Some have speculated that Gabbard’s November 2015 vote for the cynically named SAFE (American Security Against Foreign Enemies) Act, which sought to ban the resettlement of Syrian refugees in the US, endeared Gabbard to the likes of Trump chief strategist and soon to be White House counselor Steve Bannon. Yet this is unfair. When Trump weighed in on the refugee issue around the time the SAFE Act was being ushered through the House, he condemned the plan to resettle 10,000 Syrian refugees in no uncertain terms, denouncing it as “one of the great Trojan horses.” He then went on to declare that we cannot let Syrian refugees “into this country, period.” Yet Gabbard’s objection to the resettlement program was based on the not-unfounded concern that the Department of Homeland Security (DHS) wasn’t up to the job. In a statement defending her vote, she noted that “originally, like many Democrats…I was inclined to give the benefit of the doubt to the Department of Homeland Security and the Administration,” but, she continued, “Homeland Security Secretary Jeh Johnson and White House Chief of Staff Denis McDonough failed to answer simple questions about why they were opposed to the bill, which led me to change my mind.” Johnson and McDonough failed to assure the 47 House Democrats who also voted for SAFE that the DHS had allocated enough staff to properly certify that the vetting process was in fact being carried out. As such, Gabbard’s position is qualitatively different from Trump’s. Yet questions remain. Among them: Would Gabbard’s sober realism be drowned out in an administration dominated by hardliners like Steve Bannon, the just-named National Security Advisor Michael Flynn, and a Secretary of State John Bolton or Rudy Giuliani? How would Trump reconcile the positions of longtime Iran-hawks like possible Defense Secretary James Mattis with Gabbard’s oft-stated opposition to overthrowing Assad, who is a longtime client of Iran? Nevertheless, in meeting with Gabbard, Trump is hopefully signaling that he is seeking to move away from the counterproductive, dangerous, and largely self-perpetuating foreign-policy consensus of regime change and military intervention of the past 25 years. It is unlikely the president-elect understands that in order to “make America great again” he will need to form a cabinet not of far-right male clones like Bannon and Sessions, but will also have to embrace America’s diversity—as well as a good deal of independent, iconoclastic thinking. Yet if that unlikely event is the case, then a Secretary Gabbard just might fit the bill.